In the world of internet, people want easier and quicker ways to get everything done. 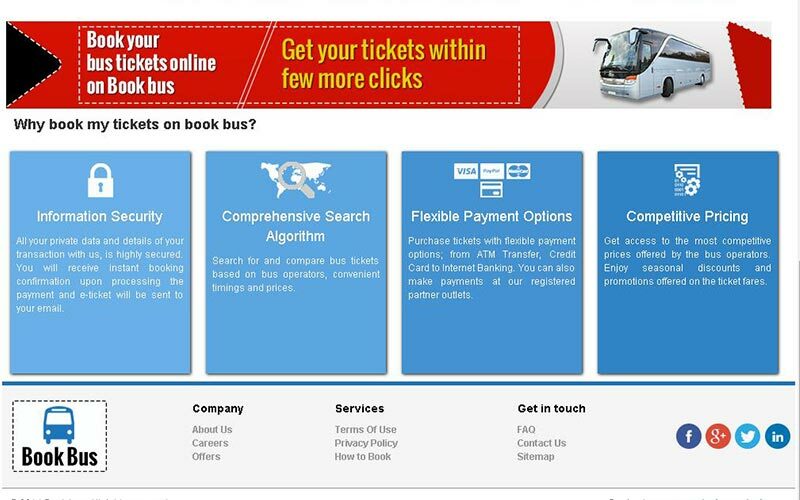 Bus booking is one of the trending marketplaces in today’s internet world. 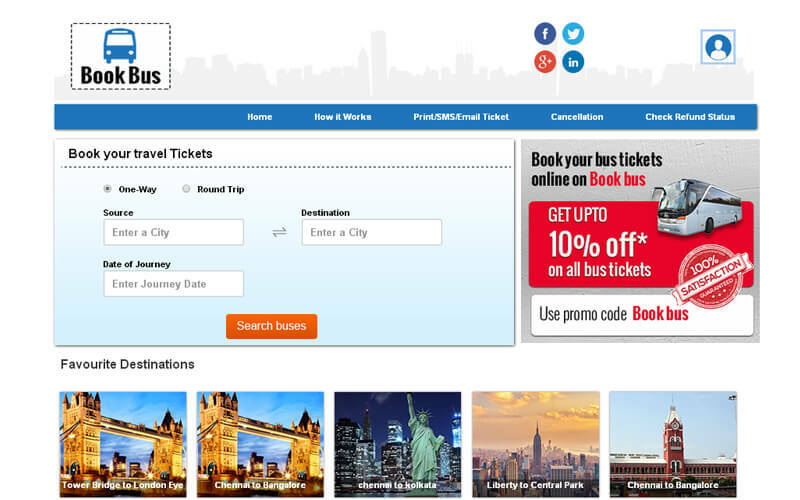 If you are looking to start your own travel booking website, then our Bus Booking Script is the perfect solution for you to get started now. Our script is developed with all the necessary features that are needed for the bus booking industry. We have designed the Online Bus Booking Software to help entrepreneurs, so that they don’t start from build the website from the scratch. 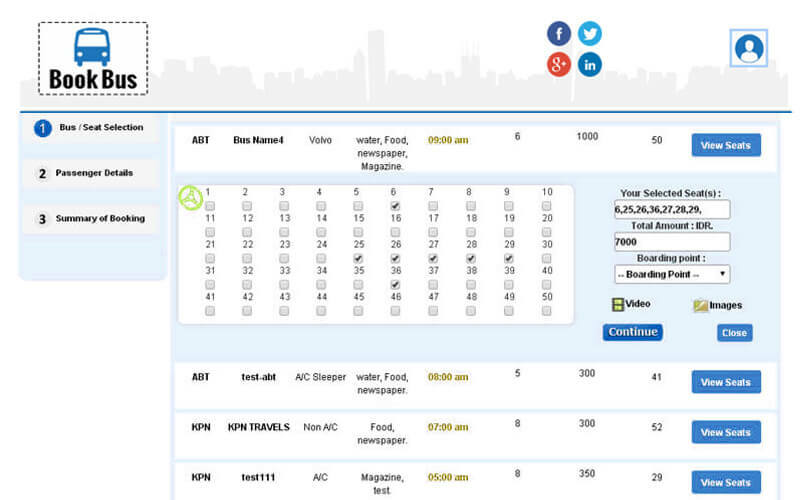 Our Bus Reservation Script benefits both the users and the bus owners/agents. The user account page enables you to view all transaction details, registration, login, cancellation, refund status, etc. The script suits for the bus owners and entrepreneurs who can launch the site to make other bus agents and owners to list in their website. 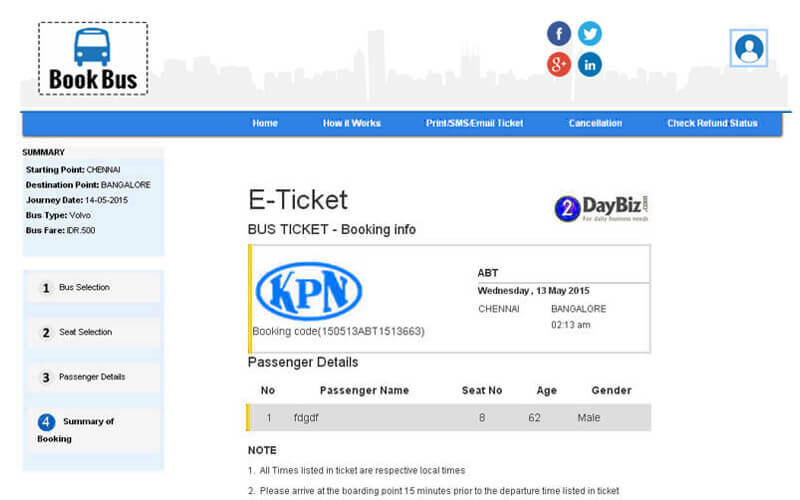 For the bus booking agent: Advanced Bus Booking Script can use this website as means to get commission by sale of ticket. They can set their own price for the tickets. Separate login panel enables them to know number of seats sold; they can add bus photos, videos, and destinations. Refund policy can be set an each vendor and they can add their own rules and regulations. For the admin side: Being the site owner gives you entire control over the website including a clear dashboard with a graphical view to understand the overall sales details, agent details. The admin can manage settings for city, route, and service provider; add countless number of agents, commission details as well as the promotional codes. Franchise Model: We are pioneers in the market to develop this special and highest advantage feature. This franchise model feature permits users to set up their franchise at any place. It is controlled by the site admin. The franchise can deposit the money, book the tickets, cancel the tickets as well as view the commission details. Site admin will have complete control over franchise and have clear view about the sale of tickets, cancellations and commission details. Thus, it is beneficial as well as convenient to all. There are various revenue models that have been integrated with this script such as banner advertisements, Google AdSense, admin can set the commission rates for the bus agents. Revenue Generation: Revenue will come from banner ads and the set commission percentage for sale of tickets. Social Media Login: Advanced Bus Booking Script supports social media integration so that user can directly login from the social media sites in order to save time spend on new registration. Email & SMS Notification: This product has advanced feature of sending notification of the transaction details of the tickets through both email and SMS to the customers as well as admin. SEO friendly: You do not have to spend huge amount for Search Engine Optimization since Bus Booking Script is SEO friendly and allows new agents automatically listed. Payment Gateway: PayPal and 2Checkout are the default payment gateways and we can also customize as per your requirement. Security: We understand that everyday million dollar transactions take place; hence we have developed our code with high security coding style and separate and clear codes for transfer of information through payment gateway, email and SMS. Performance: The code is developed by open source technology and we have optimized the code in order to deliver high performance. It supports million of users at the same time. Also, the large number of agents can be added through admin. User-Friendly: Owing to our long experience in the industry, we understand the product that needs to be user friendly, thus both the admin can easily manage the website as well as the user can easily use the website without much technical knowledge about. Go Next Now: Once you buy the Advanced Bus Booking Script, your website will online within the next 24 hours! View and manage profile details. 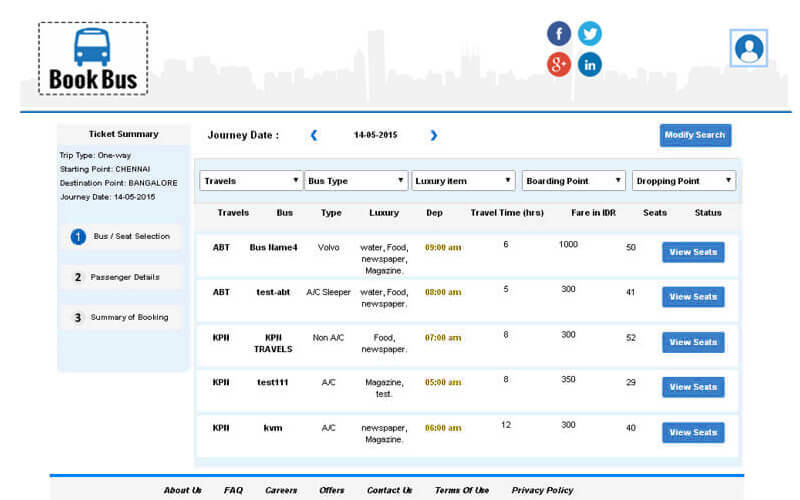 View and manage the passengers’ detail. Search by ticket no, travel date, user type and place. View and manage booking details. Search by journey date and detail. View and manage the ticket details. Search by ticket no, travel date and place. Search by ticket number, travel date and place. Cancel the ticket by entering ticket number and mail id. Check the refund amount of the ticket amount by entering ticket number and mail id. View and manage payment detail. Add and manage service partner. Search by type and status. View and manage deposit details. Search by date and keyword. Add and manage service provider. Search for a service provider. Add and manage master franchise. Search for a master franchise. Add and manage service partners. Search for a service partners. Add and manage user details. Search for user by type, gender, user type and status. Add and manage passenger details. Search for passenger by type, gender, user type, travel date and place. Add and manage bus type. Add and manage blocked seat details. Add and manage promotional code. Add and manage coupon code. Search by bus type, status and destination. Search by provider name, ticket number travel date, user type and place. Add and manage cancellation policies. View and manage payment details. Add and manage banner ad details. View and manage the site settings. View and manage the CMS content. Add and manage luxury item. Search for a luxury item. If you have any queries, feel free to reach out to us, we would be happy to help you out. It is a good script and very useful to me. Managing the availability of tickets is very easy for me. I thank the company for helping me so much in my business and for making everything so simple. I recommend others also to buy this script and make your business also easy. I have Purchased your theme and i really want to tell its a great and awesome script. I love this bus booking script. Get a fine design for your web projects. Everything fits together and you can realize your own style easily. If I had some questions related with script they helped me with Skype and documentations steps are very ice I could easily understand. Thanks Scripts Mall definitely you guys are rock stars!! !